Another 100 other plans might be able to make cuts to thousands of retirees' pension checks. Pensions aren't so sacred anymore. Just last month, thousands of retirees found out that their once untouchable benefit checks could be cut. And more cuts could be coming. Under a new law, about 100 pension plans might be able to reduce benefits, according to the Pension Benefit Guaranty Corporation. A lot of the workers covered by these funds are union members who've worked in the mining and trucking industries. They get their pension benefits from cash-strapped funds that are now, for the first time, allowed to make cuts to current retirees' pension checks. The largest, the Central States Pension Fund, already proposed cuts and is waiting for approval from the Treasury Department to move forward. The second and third largest funds at risk are the United Mine Workers of America 1974 Pension Plan, with 118,000 participants, and the Bakery & Confectionery Union & Industry International Pension Fund, which has 114,000 participants, according to a list from the Center for Retirement Research at Boston College. Neither have proposed cuts for current retirees and won't necessarily end up doing so. Before last December, a fund could reduce future benefits for current workers, but the checks going to those already retired were off limits. 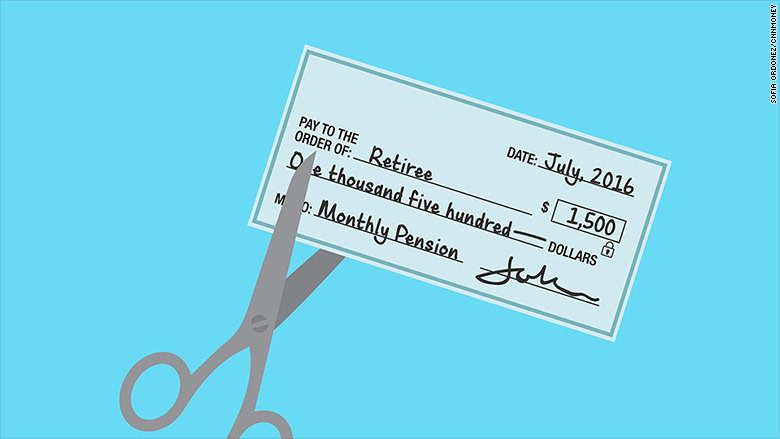 Retirees could bank on getting the same monthly check for the rest of their lives. The new law only allows multi-employer plans that are projected to run out of money within the next 20 years to make cuts. It doesn't include public pensions or private pensions that cover a single employer. And the cuts can only go into effect after being approved by the Treasury Department. Between 5% and 10% of all multi-employer plans might be eligible to make benefit cuts under the law, according to the PBGC. "We anticipate that only a fraction of the plans that potentially could make benefit cuts under MPRA will do so," a spokeswoman said. Multi-employer funds cover about 10.4 million people. They are set up to provide benefits to workers at several different companies, usually in heavily unionized industries. More than one-third of workers covered by this kind of fund are in construction. Others are in retail, manufacturing, transportation, food services, entertainment, printing and newspapers. There are several reasons some funds are in financial trouble, but multi-employer plans have been hit hard as union jobs have declined, leaving plans with more retirees than active workers. The Central States Pension Fund, for example, currently has five retirees for every worker and pays out $3 in benefits for every $1 it's bringing in and is expected to run out of money in 10 years. Funds can't jump to reduce benefits before taking other actions first. Those with funding problems are first put on notice by the Department of Labor. The fund must stop paying any lump sums to new retirees and restrict benefit increases or contribution cuts. If that doesn't work and the fund is still projected to run out of money in 10 years, it can then propose to cut current retirees' checks. Under the law, a fund still can't cut benefits for anyone over 80 or receiving disability checks.